should be selected this way to save the .se and .gce files to disk. 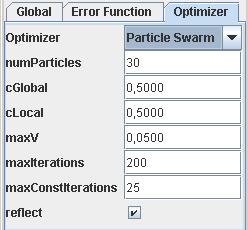 Optimization and visualization parameters can be configured via the parameter dialog (menu Options/Options). (default 1.0) Can be adapted to grow/shrink the polygons to fit better in the bounding box which may occur if the intersections between sets is very small (so the diagram is too wide for the bounding box - reduce e.g. to 0.7 in those cases). (default 173) The random seed value ensures reproducible results (for one software version). Other solutions are found if this value is changed. For negative values the current system time is used as random seed. (default 10) The number of optimization steps after which the currently best solution is shown while the optimization is running. (default 10) Exceeding the maximum number of categories shows a warning message. Raise this value to suppress warnings. Higher number of categories may need more computational power. 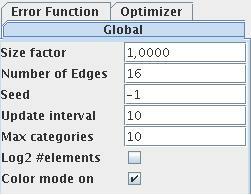 Log2 #elements Activate this checkbox to transform the number of elements to logarithmic scale. For consistency we set log(0)→log(1)→log(2)→1. Color mode on Toggle color mode on/off. (default 1.0) Allow changes of the polygon radii (experimental). 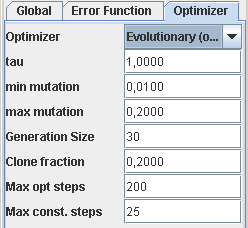 Different optimizers can be chosen in the Optimizer panel (The Evolutionary newis experimental). The mutation parameters (like min mutation and max mutation) behave relative to the bounding box where the individuals "live". So a mutation rate of 0.2 can move an polygon 1/5-th of the total bounding box. (default 30) How many individuals are in the generation (25-100 individuals are reasonable). (default 0.2) The best individual has N=clone fraction * generation size outcomes. The individual with rank r has at most min(1,N/r) outcomes. 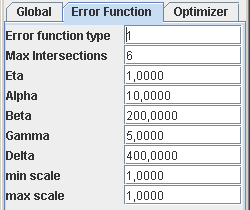 (default 200) Maximum number of optimization steps. Increase this value for better solutions. (default 25) Stopping condition for the evolutionary algorithm. If there is no cost improvement in the best individual within max const steps epochs the optimization will be stopped. Increase this value for better solutions. (default 30) How many particles are in the swarm (25-100 individuals are reasonable). Each particle represents a solution to the problem. (default 0.5) The velocity of each individual is influenced by the global optimum (that is: the best individual to its best iteration up to now). (default 0.5) The velocity of each individual is influenced by the local optimum (that is: the optimum of the respective individual up to now). (default 25) Stopping condition for the evolutionary algorithm. If there is no cost improvement in the globally best particle within maxConstIterations epochs the optimization will be stopped. Increase this value for better solutions. (default true) If reflect is checked the particles are reflected at the bounding box (the domain of the optimization problem) resulting in an inverted velocity vector in the corresponding coordinates. This optimizer is the default optimizer. It's the parallel version of the PSO and uses the same parameters. It will dynamically chose the amount of parallel threads to use based on the number of processor cores available on the machine. The two -Xoptions are necessary to adapt the memory assignment to VennMaster. For larger problems it may be necessary to increase those values (e.g. to 512).